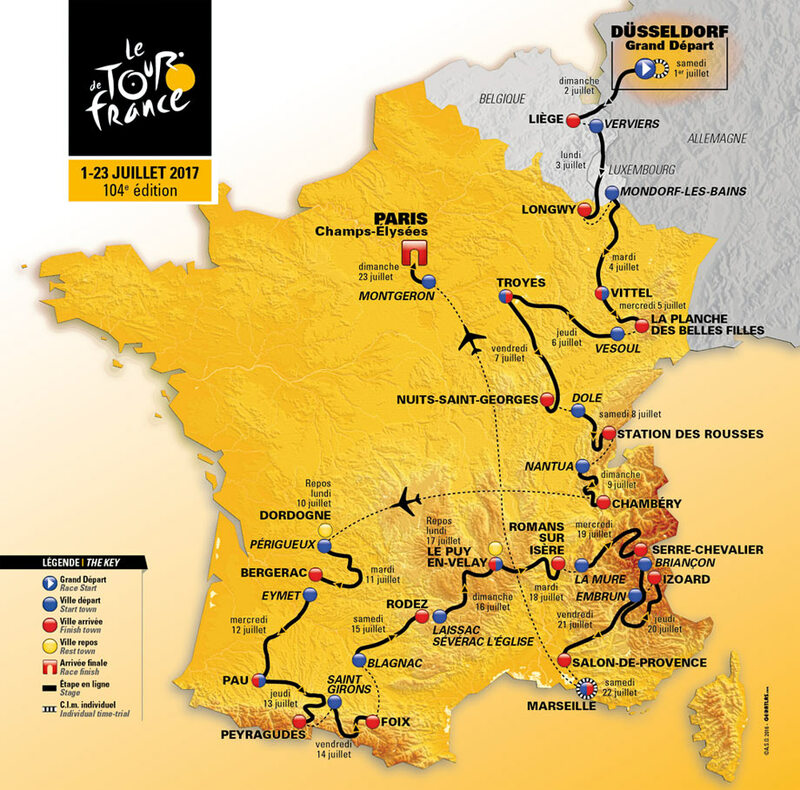 PezCycling News - What's Cool In Road Cycling : Tour de France 2017: The Route Revealed! Tour de France 2017: The Route Revealed! 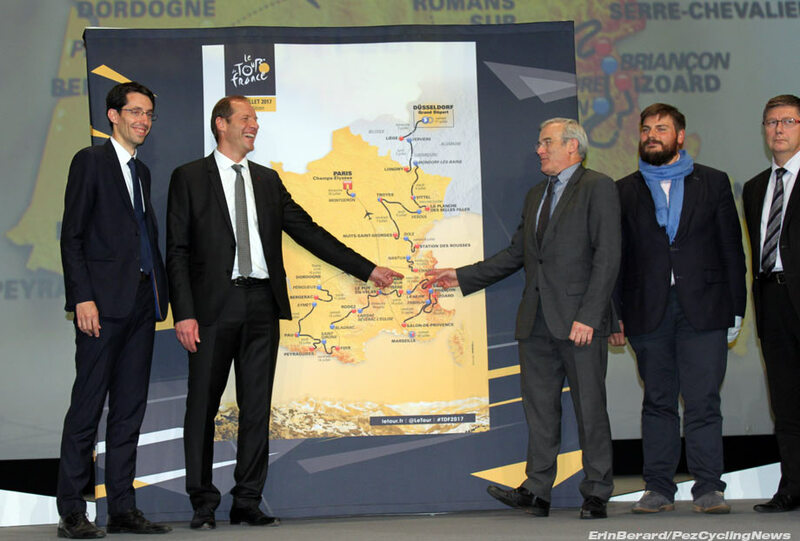 The 2017 Tour de France route was revealed Tuesday in Paris, and PEZ was there! Here’s our PEZ-Clusive look inside. Starting in Germany for the first time since 1992, and taking in all 5 mountain regions of France, there are 10 new stage cities and the first ever finish atop the Col d'Izoard. 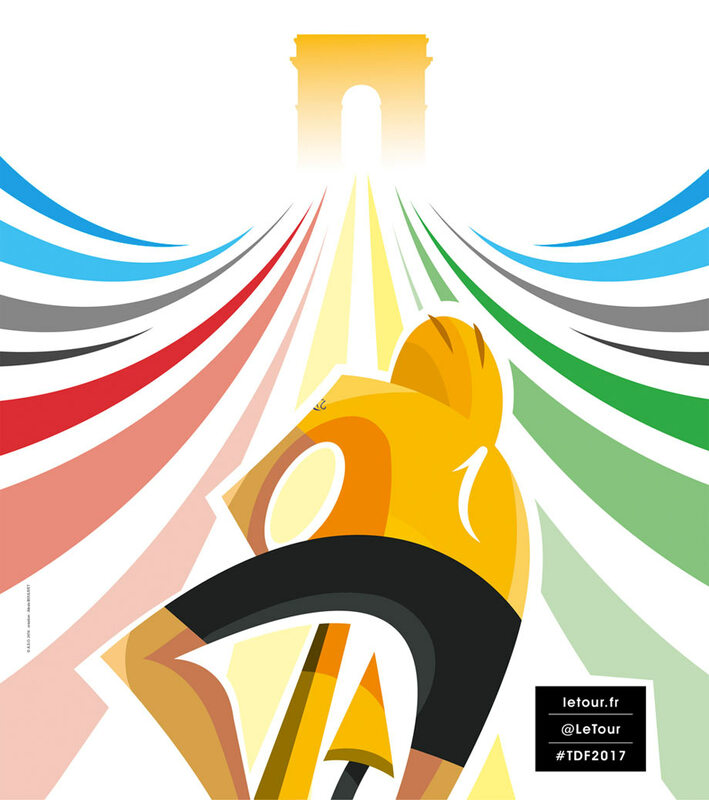 Every July, as the peloton races up and down the Champs-Elysée for the last time towards the sprint finish, the speculation has already started and rumors spread about what will be next year’s route… we only know where it will start and the rest is left to our imaginations and best guesses. 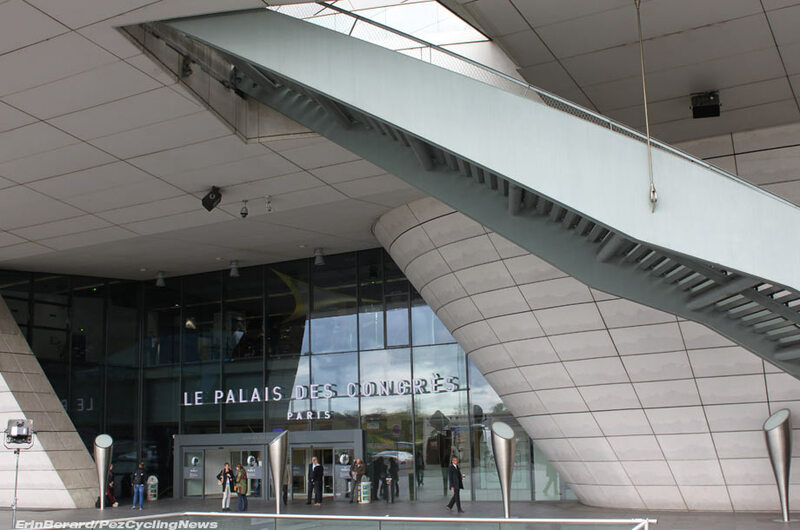 Then, come the third Tuesday in October, the the Amaury Sport Organization (ASO) throw the equivalent of a Hollywood A-list party at the Palais des Congrès, in the heart of Paris just up the street from the Arc de Triomphe. On the guest list are 4,000 of their best friends, sponsors, and stage start and finish city politicians, ex-pros and cycling legends, paparazzi (us press), and anyone else lucky enough to have a friend with an extra ticket. Why all the fuss? To celebrate and reveal the route of the world’s greatest bike race. VIPS are even organized by the official tour colors: VIPS and sponsors are Red, Pro riders and team management are Yellow, Press are Green, and Regional Politicians and Officials are White. 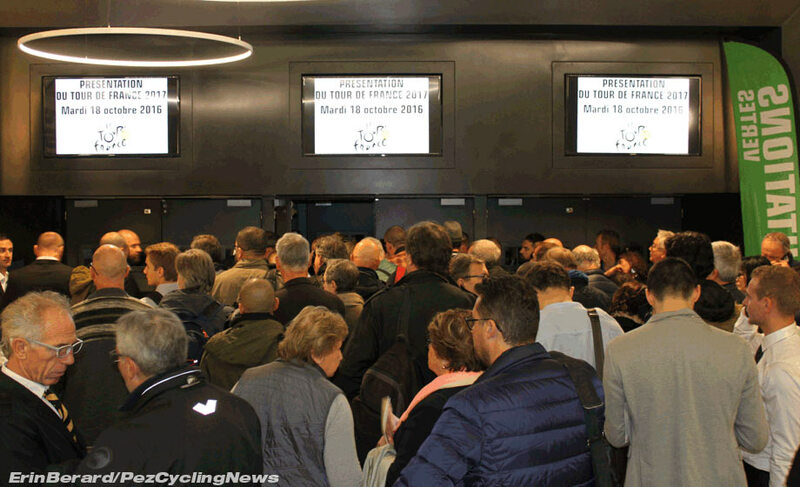 Compared to other years’ route announcements, this year’s was much more orderly and process-oriented, almost akin in the cycling world to the placement of barricades all the way up Alp d’Huez. Gone were the rock concert-like pushing and shoving common to previous years. The Press even lined up to enter the theater. 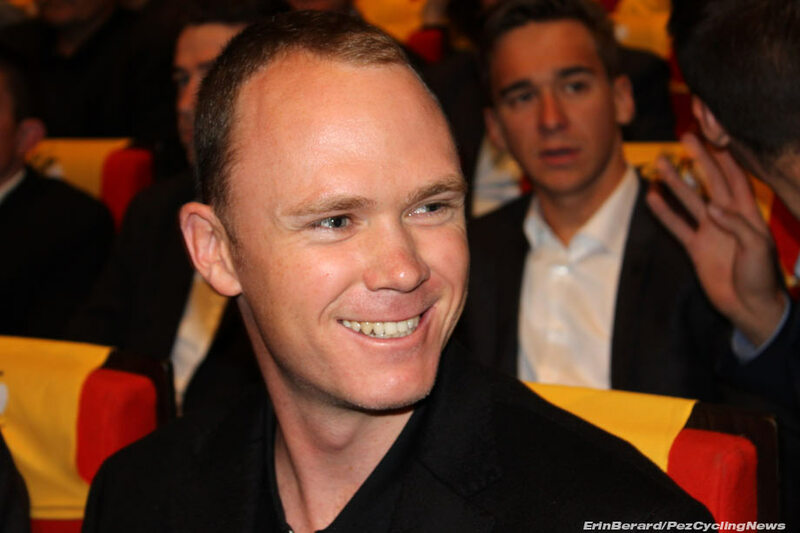 Could it be that Froome’s courteous UK style is rubbing off a little on the French? We, the press, even received with our invitations a time schedule and a list of the pro riders attending. Until now we could only guess and make bets on who would show up. 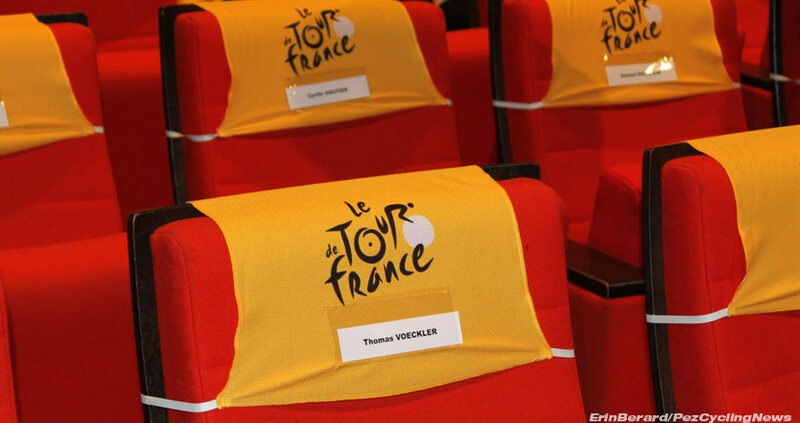 After the doors opened, there was time to scout out some of cycling’s legends arriving in the VIP seats, such as the Badger (Bernard Hinault), Pou Pou (Raymond Poulidor) and Rico (Richard Virenque). 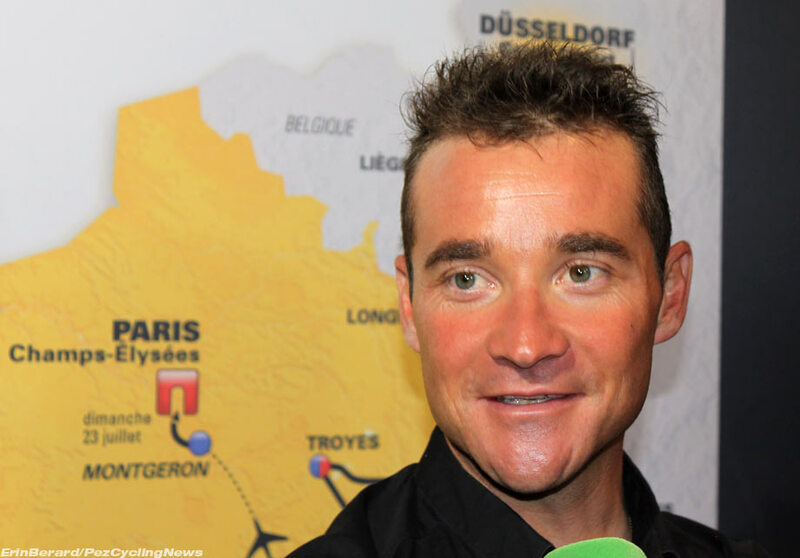 Richard Virenque had been keeping a low profile, on his phone for most of the start but then was escorted down a row to join Pou Pou and the Badger. The two front rows were reserved for the 32 or so pro riders attending. Just behind them were a group of kids with maillot jaune color t-shirts spelling Düsseldorf, awaiting their cue to stand up during the presentation by Düsseldorf’s mayor, Thomas Geisel. As the paparazzi group grew in numbers down in the front, it was finally time for the pro riders’ arrival and it did not disappoint, as they were each announced and crossed the stage in a cat walk entrance. For someone unfamiliar with cycling, this could have easily been a Paul Smith show during London fashion week. 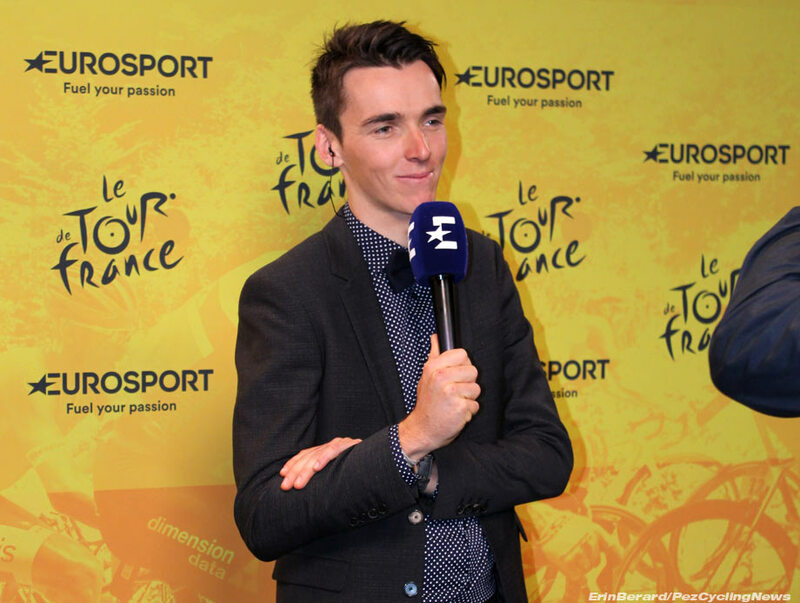 Big cheers for Thomas Voekler, Romain Bardet, Thibault Pinot, Tony Gallopin, Samuel Dumoulin, Nacer Bouhanni, Alexis Vuillermoz, Dan Martin, Richie Porte, Adam Yates, and Chris Froome, just to name a few of the big names. 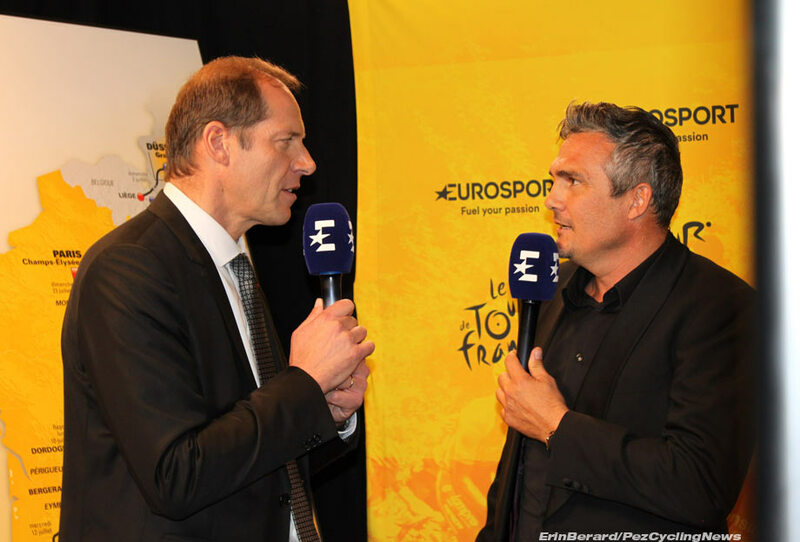 Jean-Etienne Amaury, President of the ASO welcomed us to this 104th edition of the grand boucle and highlighted the latest trend in innovations by the ASO to enhance the dynamism of the race and to grow their global audience, appeal, and reach through social media. Starting in 2015 with the addition of video cameras on the riders’ bikes, we fans have been treated to more scenery and more competitive action from the heart of the peloton and the race terrain. We have also been able to follow the race in real-time on social media. Over 100 Million videos have been generated to date. Whereas last year’s official Tour poster had been created out of fans’ tweets, this year’s poster was put to a juried design-contest on social media called “Imagine the Tour”. Jean-Etienne Amaury announced the winner, present in the audience, as 20-year old Alexis Boulivet, a student in concept art. Christian Prudhomme, Director of the Tour de France, then took the stage and treated us to a best of highlights reel of last year’s Tour de France in which we all reminisced about the crashes, great victories, more crashes, rain, and of course, the legendary Ventoux stage on July 14th when Chris Froome started running sans vélo. The footage was dramatized with Ironman movie-type music choreographed with the sweeping scenes of castles and crashes. I wondered what it was like for both Porte and Froome to re-watch those moments on Mont Ventoux on the giant screen, especially Porte’s head-on collision with the moto. 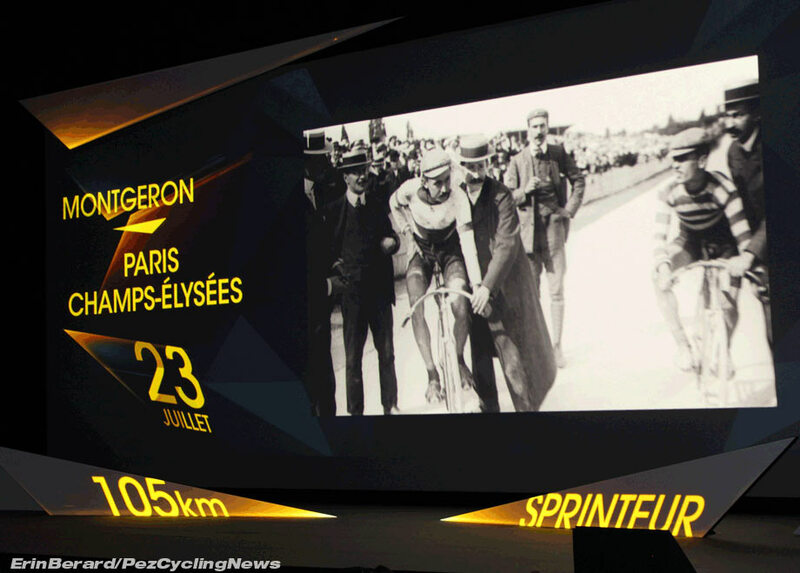 Then it was time for a look to the past, way beyond last year’s race, to the time of the Badger, a tribute montage to Bernard Hinault and his contributions to the Tour de France over the years, as a pro and afterward, complete with a standing ovation. Pou Pou had received a similar tribute at last year’s show. 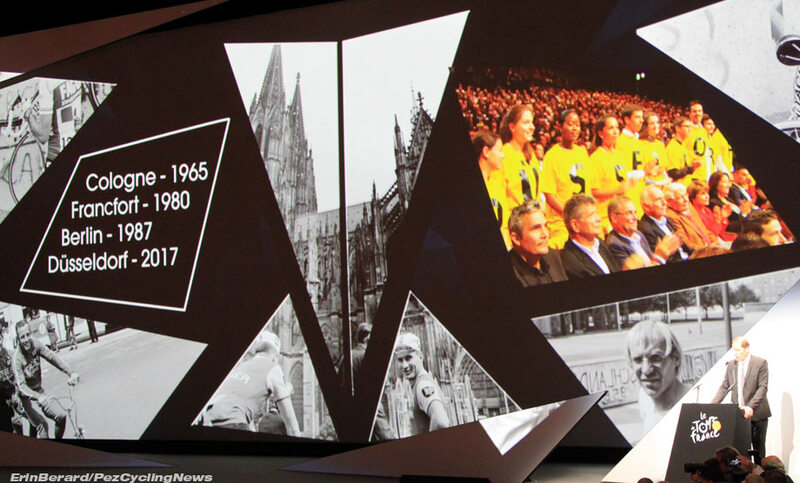 Prudhomme then kicked off 2017 with an introduction to Thomas Geisel, the Mayor of Düsseldorf, whose presence on stage inspired applause as the row of kids rose to spell the city’s name in Tour colors. Believe it or not, it has been 30 years since the Tour started in Germany. The last time was in 1987 in Berlin, preceded by Frankfurt in 1980 and Cologne in 1965. Surprising considering since 2013, Germany has led in Tour de France stage victories. Mayor Geisel then gave us an overview of his city as sports/cycling centric, the number one fashion location in Germany (ah, maybe that explains the cat walk entrance of the pros earlier), a city of Francophiles, art and culture, and he even went as far as calling it “a little Paris”, very gutsy comment at a French party in the center of Paris (if you ask me). A few minutes past noon, Prudhomme announced it was finally time for the big show, the route reveal! Similar to 2016, the ASO chose a Game of Thrones-style theme (see the actual presentation on the PEZ Facebook page here) as we watched and followed the yellow route line trace the race from Germany, to Belgium, to Luxembourg and across 34 departments of France before finally finishing up the cobblestones of the Champs Élysée. What is almost comical about this year’s route is that it is clearly the eastern part of France’s turn to shine… With Mont Saint Michel and Normandy being featured in 2016, the race has left the west, as they say. 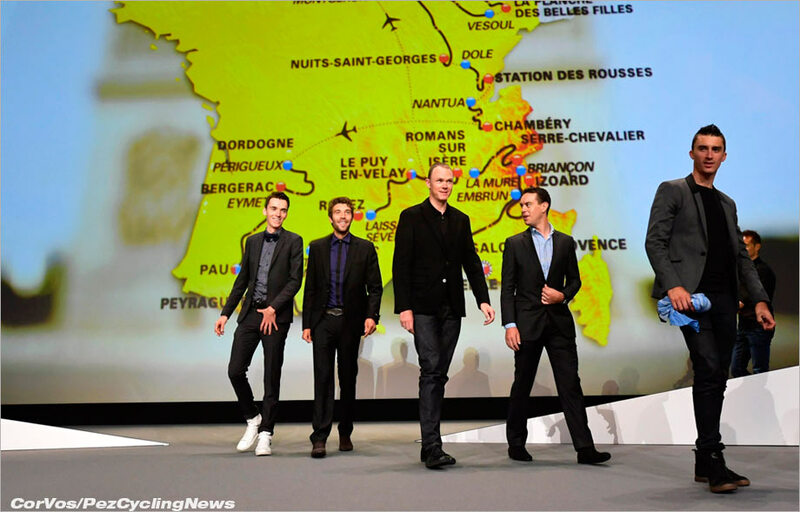 He then walked us through the route stage by stage, city by city, each highlighted by their key features and historical place in the Tour’s heritage, complete with new and vintage videos of legendary Tour moments and winners. • Stage 4 finish at Vittel where in 2012 Froome enjoyed his first-ever Tour stage win. • Stage 6 Vesoul to Troyes: it was on this route heading into Troyes in 1960 where the peloton stopped and removed their cycling caps to salute General De Gaulle, then President of France, who had come to spectate the race. • Stage 12 Pau to Peyragudes: James Bond fans may recognize this mountain top of Peyragudes from the opening scene of the 1997 movie Tomorrow Never Dies. 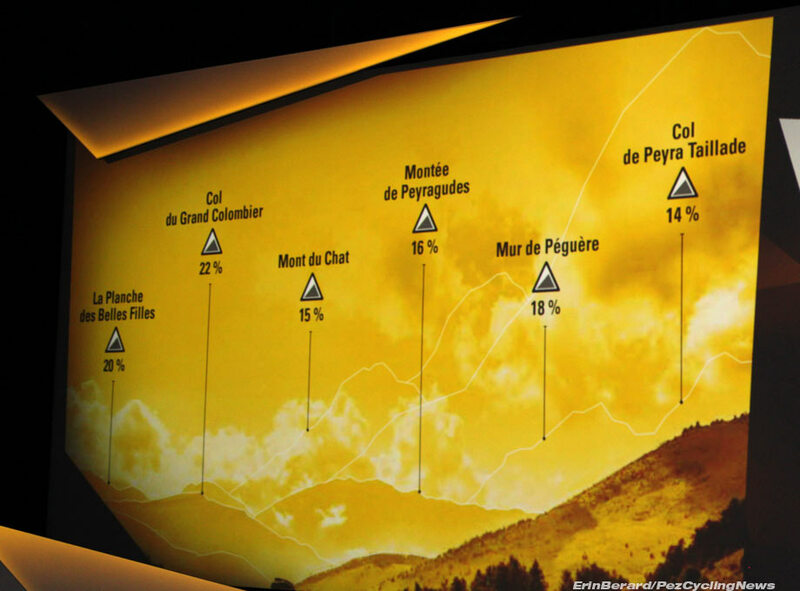 • Stage 18 Briançon to Izoard: not since 1922 has a stage finished on this epic lunar summit. In fact, this stage has been chosen for this year’s 25th edition of L’Étape du Tour (178 km), with registration opening on October 21, 2016. More interesting is that this year’s 4th edition of the women’s La Course route will race from Briançon to the summit of the Izoard for a total of 67 km). Allez les filles! Not since 1992 (25 years ago!) has the Tour route featured the five main mountain ranges of France (in order of appearance in 2017): the Vosges, the Jura, the Pyrenees, the Massif Central and the Alps. Additionally, the ASO has also made a change to the point’s classification for the polka dot jersey. They are reducing the number of points possible on HC and 1st Category climbs to reduce the gaps in points between these ascents. However, that said, the first climber up the Col d’Izoard will receive double points. Afterwards, PEZ caught up with a few pros to get their thoughts on the 2017 route. 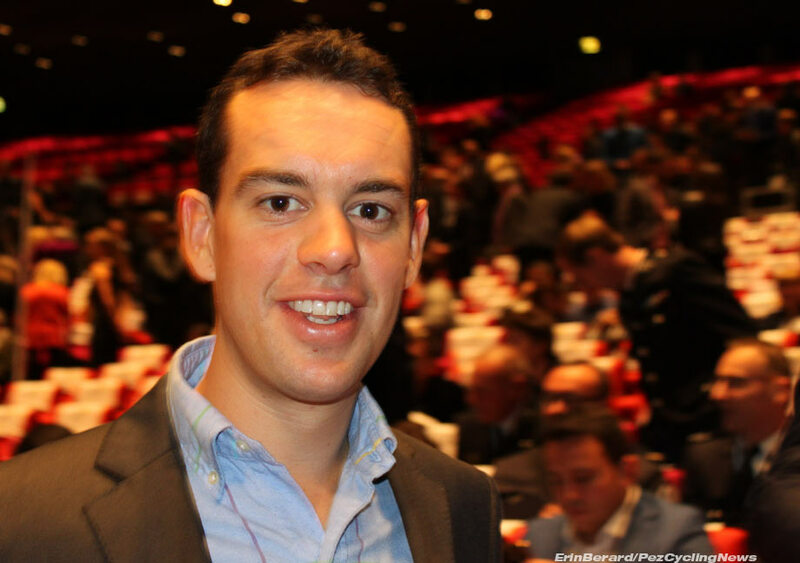 Thomas Voekler was all smiles and looked quite tanned after a sunny vacation. He will be 38 this year and is most likely retiring after next year. He is taking this year’s Tour seriously but also admitted he is going to try to enjoy it, bitter sweet. 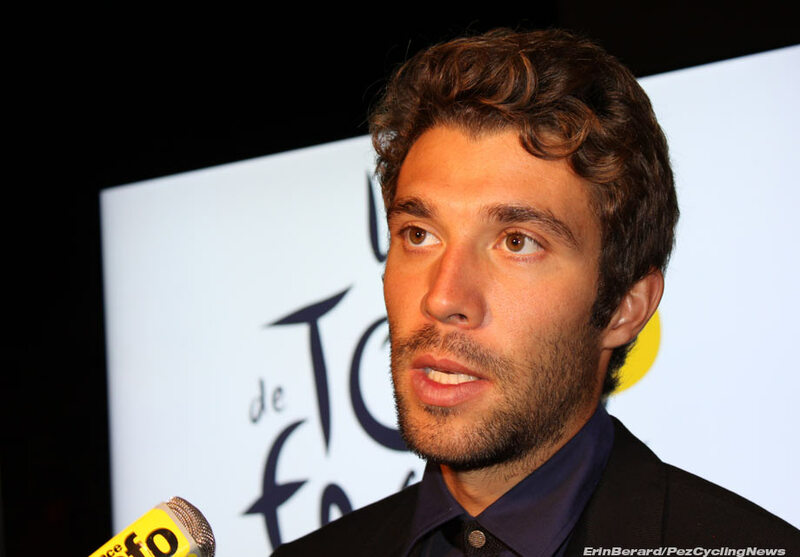 Thibault Pinot thinks the route will be tough for teams to manage with the distribution of mountain stages across all five ranges. He is hoping for “bonne jambes” (good legs) this year. 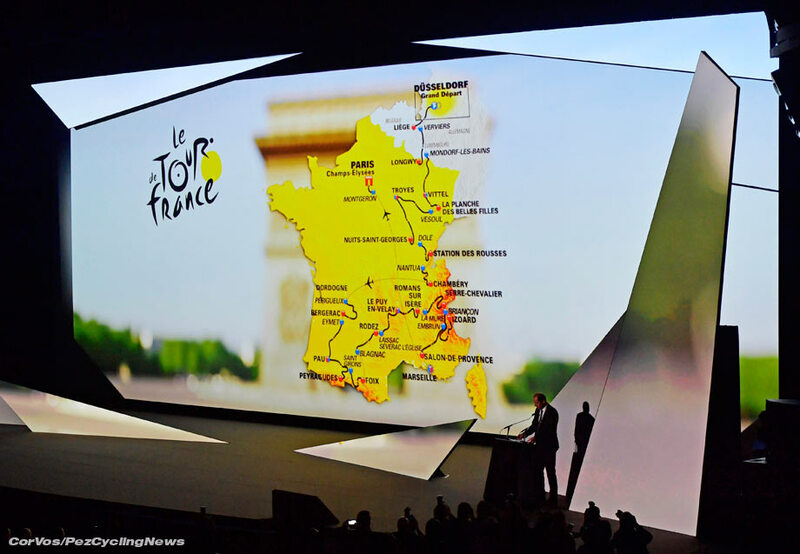 Running from Saturday July 1st to Sunday July 23rd 2017, the 104th Tour de France will be made up of 21 stages and will cover a total distance of 3,516 kilometers. Stay tuned as we’ve got much more to come from Paris, and the full PEZ-Analysis of the 2017 Tour de France route.